As seen in my last post there were a few issues with my open RC build that needed resolving. The first was the front wheel axle snapping. I have since printed a whole collection of front axles with 100 % infill (solid). This makes them much stronger than when they were only 20%. As I printed a whole bunch I have spares at the ready if I need them. The next thing to look at was the steering. Here I was having issues with the servo not centering the wheels with no input. This indicated there were binding issues but it seems the servo may have also been at fault. While playing with the trim settings on the transmitter the servo went crazy and melted itself. There was a lot of smoke coming out so I quickly ripped out the Lipo battery and took the car outside. The house stunk of burnt electronics. The offending item was removed and remarkably caused no warping to the PLA chassis. I fitted a new servo and adjusted how the servo linkage worked to make the wire straighter. I also used a multitool to sand down the inside of the car body so that the servo rod no longer snagged on it. Lastly I added a washer between the servo saver and lower chassis. These things combined have fixed the steering issues I was having. The steering now centers itself and responds a lot better than before. I have been having a lot of fun printing TPU tyres at different settings and have made some progress with regards to producing tyres with more grip. That said the TPU tyres always lacked the grip of a rubber tyre so I caved in and brought some Tamiya tyres. I will go back to TPU when making a heavy vehicle as part of the problem is that the f1 car is so light the tyres are not creating much friction with the ground. The Tamiya tyres. I had no idea that these came in different compounds so I ended up with super soft rear tyres and standard front ones. New rims had to be printed for the Tamiya tyres and the wheel ends up a bit bigger than the printed tyre version. You can see that the rear tyre almost touches the bargeboard. This is good as it increases ground clearance a little which should lead to less damage when driving over uneven terrain. I have only tested the Tamiya tyres indoors at the moment on wooden floor but I can already tell they perform miles better than the TPU tyres. I did make a second video however of my second generation TPU tyres at the weekend. These were a step up from my previous attempt which were much too hard. These are printed at 10%. I still have not had much success with printing them at 5% at all. Next time with the rubber tyres the lack of grip should be a thing of the past! I recently built a new 3D printer having wanted a bigger build bed and to go back to open printing. I went for the Ender 3 Pro which has turned out to be a great machine for the price. I have always wanted to print and build an Open RC car but did not have a big enough print bed to print the parts. Now I do however so I thought it would make a good test for my new printer. All of this model apart from the Tyres will be printed in PLA. The Tyres will be printed in TPU so that they are flexible. Before going on to another tank I have decided to have a go at something a bit different. I finally finished a model for the first time in a while. There is still some tidying up I could do but considering my back log of half built kits its done for now. I decided to build a police car after playing Need for Speed Rivals and its not something I would usually build. In fact this is probably the first road car I have ever finished. I am pleased with the results and hopefully this will inspire me to tackle some of the more challenging kits on the pile. I purchased two police officers from eBay to fit into the kit. These required cutting down and even then I only just managed to squeeze them in. 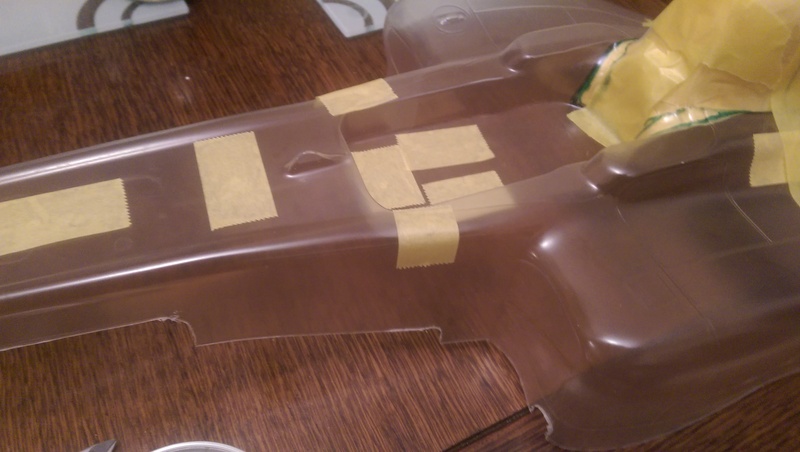 I have started applying to the car body. This is the part I have been looking forward too most as it turns a plain body shell into something much more detailed. This has been an interesting model to paint, requiring lots of careful hand painting around the window frames and other areas. I still have a bit of tidying to do but its getting there.